Ovation is on the case. This week, the network announced they will air season 11 of The Artful Detective in 2018. 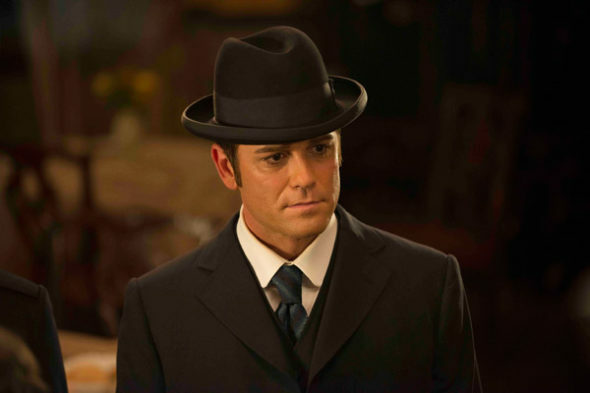 Titled Murdoch Mysteries in Canada, the period drama stars Yannick Bisson as William Murdoch, a detective working for the Toronto Constabulary at the turn of the 20th century. The cast also includes Helene Joy, Thomas Craig, and Jonny Harris. Season 11 of The Artful Detective is set to debut on Ovation in January 2018. Los Angeles, CA – October 13, 2017 After building a dedicated fan base over the last 10 seasons, Ovation TV, America’s only arts network, is returning for season 11 of The Artful Detective. The network has acquired US premiere linear rights to The Artful Detective, season 11 (18 x 60′) from ITV Studios Global Entertainment. The twist-filled season 10 finale saw the futures of Detective Murdoch (Yannick Bisson) and the heroes of Station House No. 4 in jeopardy amidst a corruption investigation gone awry. Season 11 will pick up with the aftermath of the finale’s events that left the lives of Murdoch’s beloved Dr. Julia Ogden (Hél�ne Joy), Inspector Brackenreid (Thomas Craig) and Constables George Crabtree (Jonny Harris), Henry Higgins (Lachlan Murdoch), and Slugger Jackson (Kristian Bruun) at stake and their fates unknown. Season 11 storylines will feature a number of Canadian and international historical figures, including physician William Osler and Helen Keller, the return of artist Tom Thomson, President Theodore Roosevelt, and Alexander Graham Bell. Known as Murdoch Mysteries in Canada and international territories, the series is developed and produced by Shaftesbury, in association with CBC, ITV STUDIOS Global Entertainment and UKTV, and with the participation of the Canada Media Fund, the Canadian Film or Video Production Tax Credit, the Ontario Film and Television Tax Credit and the COGECO Program Development Fund. Shaftesbury Sales Company and ITV STUDIOS Global Entertainment hold worldwide distribution rights for the series. The series is executive produced by Christina Jennings, Scott Garvie, Yannick Bisson and Peter Mitchell, who also serves as showrunner, and produced by Stephen Montgomery and Julie Lacey. What do you think? Have you seen The Artful Detective? Will you watch the new season? More about: Ovation TV shows: canceled or renewed?, The Artful Detective, The Artful Detective: canceled or renewed? X Company on Ovation: Cancelled or Renewed for Season Three? X Company: Is the Ovation TV Show Cancelled or Renewed for Season Two? The Artful Detective on Ovation: Cancelled or Renewed for Season 12? I love the series I don’t miss an episode I cant wait for the next season I loved the was this season ended. I was so excited about them having a baby but after watching this past Saturday’s show and them making them lose it, I turned it off, I was so mad. I will probably not watch it again. She has a miscarriage and then turns around after just getting home from the hospital & jumps right into helping on a case?! Really? Why did they end her pregnancy? It may just end the series, it did for me. Why are the writers making Julia’s part so obnoxious??? She WAS a strong, capable woman – now she’s a whiny, law-breaking idiot…. I love this show. I realize Yannick Brisson is very busy,but I hope this series continues. I watch the show regularly! Mystery, science, and history all in one show. I absolutely LOVE this show! Love this show . Season 11 very entertaining and hope for season 12. Like the show a great deal, HAVE WATCHED SEASONS 1-6 ON Hulu and purchased 7-10 from iTunes. This Ovation thing has flown me for a loop however. I have cable, but no Ovation available. I already use firestick and stream Netflix, Amazon, Starz, and Hulu. I don’t feel like shelling out anymore money for TV, so I guess I’ll just wait and hope iTunes makes it available for purchase after it airs on Dum-vation. Absolute favorite series on television! I love this show. The acting is top notch (I’ve been a fan of Yannick since his “Sue Thomas “ days). Helene Joy and the rest of the cast are wonderful! Please continue this well written, well directed period piece FOREVER! Why isCanadian TV so far above American TV (except for PBS)? Love the show..only I missed the first few episodes of season 11 already. For some reason they didn’t tape, then “The Accident” episode taped yesterday. I did see that Netflix has season on there, so I’ll have a chance to catch up. Yes I will watch. It is my favorite. Love Artful Detective! Very proud this Canadian Show is so popular in the States! Extremely well done and love the involvement of famous historical figures!